Home » birds , photography » "Life finds a way." 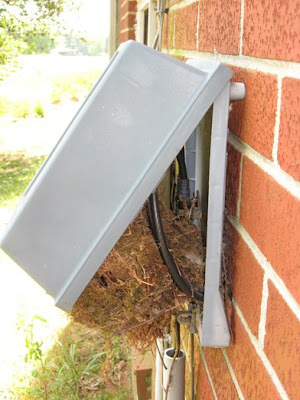 This is the nest that some birds have made in the satellite television box on the back of my house! Nevermind all those cables and wires and other potential hazards to wildlife. I'm just astonished that they were able to open the box to begin with... and then build what otherwise looks to be a comfortable avian domicile inside of it. While I was taking this picture a startled bird flew out. I was able to count a number of eggs within the nest. There is another built atop an outside light beneath the overhang of the roof. I suppose that wherever there is found a niche - whether left by God or man - that nature is quite adept at filling it.